When cryptocurrencies are mentioned, everyone thinks of bitcoin and Ethereum. However, there are plenty of other digital currencies, most people do not know of since they do not get enough media attention. One of these is Stratis, which surged up to the 9th most valuable currency at the end of May, currently standing on the 10th place. Stratis operates a Blockchain as a Service (BaaS) platform, which is similar to SaaS, but it is specifically designed to offer services on the blockchain. The platform is similar to Ethereum, however, instead of turning the main focus on ICOs and smart contracts, the company has a wide variety of features that cover possible needs in the blockchain space, which is used to offer their services to other firms. “Our enterprise-grade development platform nStratis is a simple and affordable end-to-end solution for native C# and .Net blockchain applications: solutions tailored exactly to your specific needs – at very competitive rates. Our proprietary blockchain combines the latest advances in security and stability of Bitcoin with the latest breakthroughs in network speed, scalability and customization,” Stratis writes on its website. BaaS allows a company to set up a blockchain on the Stratis platform in a quick manner. When a firm sets up a blockchain on Stratis, it is called a sidechain. This set up by the client company operates as a branch of another blockchain, which will simplify the process for the client firm. Just like Ethereum, Stratis has its own cryptocurrency called Strat, which fuels the platform. As of June 25, Stratis trades at $7.58 according to CoinMarketCap’s stats. According to INC.com, Stratis mainly relies upon the ICO market with speculators expecting a positive advance of Stratis on the long term. “$STRAT is the fuel that powers and secures the Stratis blockchain. It is used to pay fees per transaction and as an instrument for transfer of value among participants in the Stratis marketplace. $STRAT is a digital cryptographic token that is freely traded on open exchanges as one of the top cryptocurrencies by marketcap. The Stratis blockchain is based on the Bitcoin consensus algorithm making it one of the most reliable and secure cryptographic tokens today,” Stratis wrote. According to INC, without being too technical, Stratis solves problems that even Ethereum has not solved yet — mostly because of networking problems. Stratis implemented sidechains to its tech to avoid such problems. 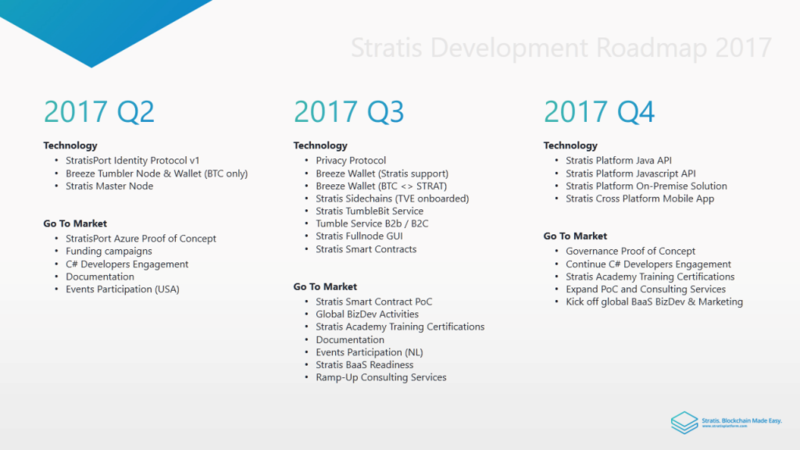 Stratis assembled a well-made roadmap focusing on longer term plans in order to make their platform stable, robust, and scalable. Speculators had already seen the potential in Stratis because of its scalability potential and solid tech, which could make it the next big blockchain platform.